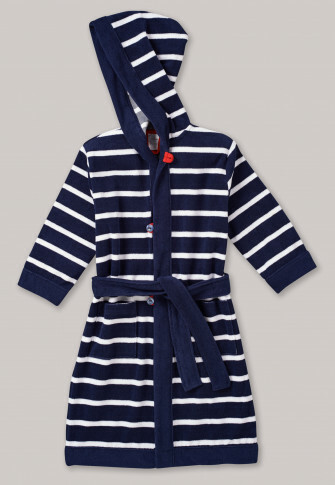 Small pirates can make themselves completely comfortable in this white-blue-striped boys' bathrobe! Two attached pockets, a hood, the belt and the great button placket do not only make the bathrobe a real eye-catcher, but they also feel great in wonderfully soft terrycloth. The perfect companion after every bathing adventure, for cuddling and just feeling well in best SCHIESSER quality!